The ancient proverb “Seeing is believing” has been around since 1639, and means that only tangible evidence is truly convincing. However, living in Italy has shown us that just the opposite can also be true—”believing is seeing.” Thus begins a short tale about a window. We live in an old Italian farmhouse in the hills north of Florence. The Italians take tradition and culture very seriously, so the look of the buildings and the landscape are guarded like gold. Construction formulas have been around seemingly forever, so details can rarely change—if ever. In a farmhouse, for example, there’s a formula for natural light-to-interior space. But there is also a formula limiting openings in exterior walls. It was not unusual to have a large blank wall, punctuated with only a single small window and a door. So if you want a second window, for more light or to balance the facade—well, that’s just too bad. There’s no way the formula can be altered. But in our case, the aesthetic sensibilities outweigh the formula. We are bothered by a large bleak, blank wall. Okay, we know that the formula was derived long ago when too many windows meant heat loss. But central heating is all the rage now, right? So what to do? 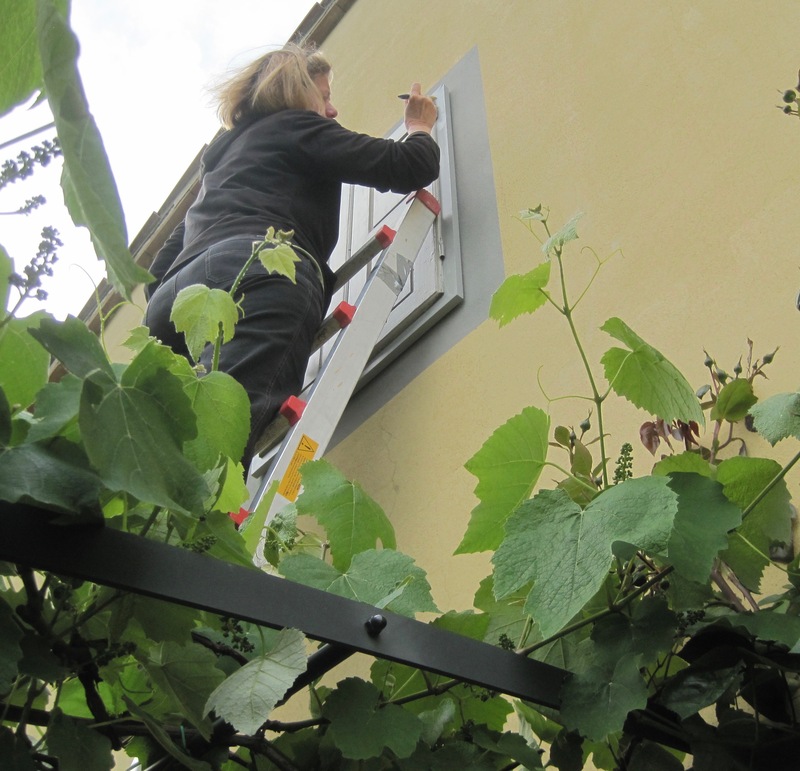 We decided that we could hang an old metal grille on the outside wall. 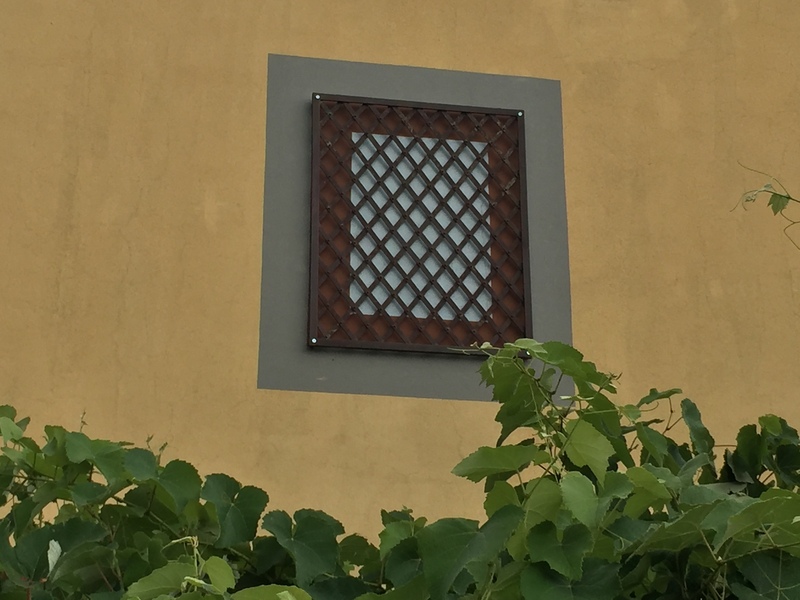 Of course, we’d paint a soft gray border around it to suggest a typical Tuscan window, traditionally framed with pietra serena (stone). So that’s what we did. No wall was pierced in the placement of the “art” as we call it, and everything we’ve done is “temporary,” which means “removable” to the authorities. We could simply paint over our faux window one day, as if nothing ever changed. Our first try was to use wood shutters, but they didn’t weather well. So we moved on to an iron solution which would last a lifetime. Our eventual imaginary window solution was pretty doggone convincing, but we weren’t quite finished yet. No. We realized that we needed a corresponding window on the inside as well. So, we went to the nearby town of Sieci, to a Mercato di Usato (the market for old, used things), where we found a sweet little wood window with beveled glass. 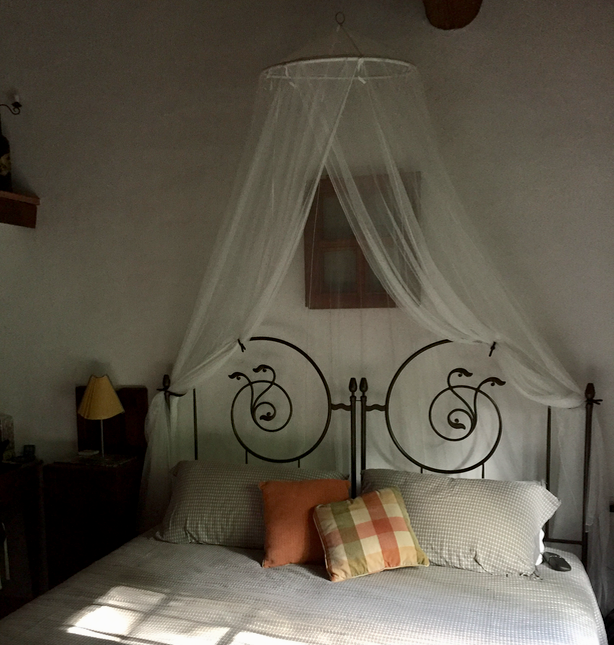 After cleaning and refinishing, up it went, behind the mosquito net over the bed in the guest room. Voilà! As you can see, our collective imaginations took a slight detour when the real window was vietato (forbidden). Now, we have the window that we thought the blank wall yearned for, some 18 years later, with one little missing caveat—you can’t actually see through it. But that doesn’t really matter. We turned a “No!” into a definite “Yes!” and nobody got hurt or did anything too drastic in the process. Seeing the window is almost believing it. But for us, the notion of believing it first provided the possibility, which ultimately made artistic expression possible. We may not have an actual opening onto the nearby moody valley, but sometimes a vision is better than a view!